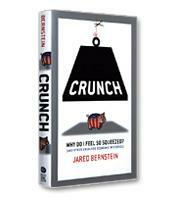 Economic inequality is at the heart of the crunch described by economist Jared Bernstein. Bernstein provides commonsense answers to questions such as whether Social Security is going bust, whether immigration is hurting native-born workers, and how much presidents can affect the economy. Economics has been used to explain why we can’t organize society in a way that is fair, equitable and efficient. A splash of humor is included to dilute the serious taste. Ever wonder why, if things are going so well, you don’t feel better? You’re not alone. There are numerous disenfranchised workers who feel that our economic system has subtly shifted against them. Take a look at the numbers. The inflation-adjusted weekly earnings of the typical worker were down 0.7 percent during the first six years of this decade even while the U.S. economy grew at a 15 percent clip. The share of the population that’s officially poor rose to 12.3 percent from 11.3 percent over the same period. And the share of income going to the top 1 percent of households in 2005 was, at 22 percent, higher than in any year since 1929. Left unchecked, this malaise threatens to erode our trust in the government and the economy, undermine our participation in the political system and ultimately lead to mean-spiritedness that is as divisive as it is pessimistic. But not if Bernstein has his way. Crunch does not read like the usual economics book. Instead, it offers an opportunity to hang out with an economist who doesn’t think, talk or act like one. In fact, Bernstein is to economic analysis what a grandparent is to child rearing — relaxed, folksy, likeable if not a little quirky. In his simple and yet effective style, Bernstein provides common-sense answers to questions such as whether Social Security is going bust (he argues it is not), whether immigration is hurting native-born workers (it does) and how much presidents can affect the economy (quite a lot). He also addresses the cost of global warming (without sacrifices today there will be monumental losses tomorrow), what the GDP actually measures (dollar value of the economy, including all goods and services from cars to lattes) and what it leaves out (environmental degradation), why teachers are underpaid (because we undervalue their work) and why tax cuts for second homes should be axed (nobody gets two until everybody has one). Bernstein keeps the conversation mercifully free from charts, graphs and statistics that encumber many similar works. By keeping his analysis humorous, light and fun, he is able to make his book endearingly simple in its profundity, while avoiding the density and obtuseness that often shroud such public policy debates. In his charmingly self-deprecating manner, Bernstein dons his economics hat (“place the propeller beanie atop head, give the prop a spin or two”) to demystify the often hyperbolic and politically charged discourse over economic policy. Economics, he explains, is simply how we organize our society to provide goods and services that we want and need. Yet, along the way, Bernstein argues persuasively, that definition has been hijacked by the economic, political and cultural elite to explain why we can’t organize society in a way that most of us think is fair, equitable and efficient. Not willing to cede the intellectual high-ground to the influential, Bernstein offers his own progressive road map to a better organized society that provides the things we want and need while improving living conditions for everybody, not just those at the top of the income scale. With a slightly quixotic tilt, he writes that the central goals of our national economic policy should be to reconnect all people, regardless of their income level, to share in the economic prosperity.